Sediment is any particulate matter that is transported by the flow of fluids (such as water and air) and eventually deposited in a layer of solid particles. The process of deposition by settling of a suspended material is called sedimentation. Sediments may be transported by the action of streams, rivers, glaciers, and wind. Desert sand dunes and loess (fine, silty deposits) are examples of eolian (wind) transport and deposition. Glacial moraine (rock debris) deposits and till (unsorted sediment) are ice-transported sediments. In addition, simple gravitational collapse, as occurs after the dissolution of layers of bedrock, creates sediments such as talus (slope formed by accumulated rock debris) and mountainslide deposits. Seas, oceans, and lakes also accumulate sediment over time. The material can be terrestrial (deposited on the land) or marine (deposited in the ocean). Terrigenous deposits originate on land and are carried by rivers and streams, but they may be deposited in either terrestrial, marine, or lacustrine (lake) environments. In the mid-ocean, living organisms are primarily responsible for sediment accumulation, as their shells sink to the ocean floor after the creatures die. The process of sedimentation helps renew nutrients in the soil, thereby supporting living organisms. Without such processes, the soil could become depleted of nutrients relatively quickly, and living organisms may not be able to survive in those same habitats. Moreover, deposited sediments are the source of sedimentary rocks, which can contain fossils that were covered by accumulating sediment. Lake-bed sediments that have not solidified into rock can be used to determine past climatic conditions. Thus, by analyzing sediments and sedimentary rocks, we can get glimpses of some aspects of the Earth's history. Rivers and streams are known as fluvial environments. Any particle that is larger in diameter than approximately 0.7 millimeters will form visible topographic features on the riverbed or streambed. These features, known as bedforms, include ripples, dunes, plane beds, and antidunes. The bedforms are often preserved in sedimentary rocks and can be used to estimate the direction and magnitude of the depositing flow. Deltas: River deltas, which are arguably intermediate between fluvial and marine environments, are landforms created by the buildup of sediment at the "mouths" of rivers and streams, that is, at places where they reach the sea. Deltas are roughly triangular in shape, but the shape depends on how the water flows, how the current changes, and the amount of sediment being carried. Point bars: They are the result of an accumulation of gravel, sand, silt, and clay on the inside bank of a bend of a river. They demonstrate a characteristic semi-ellipse shape because of the way they are formed, with larger sediment forming the base, and finer particles making up the upper part of the point bar. Point bars contribute to size and shape changes of a meander (bend) over time. Alluvial fans: These are fan-shaped deposits formed where a fast-flowing stream flattens, slows, and spreads, typically at the end of a canyon onto a flatter plain. Braided rivers: They consist of a network of small channels separated by small and often temporary islands called braid bars. Braided streams are common wherever a drastic reduction in stream gradient causes rapid deposition of the stream's sediment load. Oxbow lakes: These are curved lakes formed when a wide meander (or bend) of a nearby stream or river is cut off. 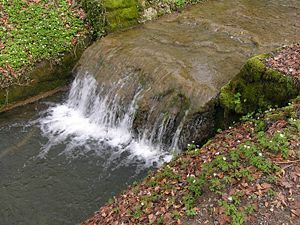 A combination of deposition and rapid flow work to seal the meander, cutting it off from the original body of water it was formerly connected to. Levees: These are natural or artificial embankments or dikes that border the perimeter of a river. They have a wide earthen base and taper at the top. Natural levees occur as a result of tidal waves or sharp meandering of a river. Artificial levees are built to prevent flooding of the adjoining land, but they also confine the river flow, increasing the velocity of the flow. Marine environments (seas and oceans) also see the formation of bedforms. The features of these bedforms are influenced by tides and currents. The following are major areas for deposition of sediments in the marine environment. Littoral (coastal) sands: They include beach sands, coastal bars and spits. They are largely clastic, with little faunal content. The continental shelf: It consists of silty clays, with increasing content of marine fauna. The shelf margin: It has a low supply of terrigenous material, mostly faunal skeletons made of calcite. The shelf slope: This consists of much more fine-grained silts and clays. Beds of estuaries: The resultant deposits are called "bay mud." One other depositional environment, called the turbidite system, is a mixture of fluvial and marine environments. It is a major source of sediment for the deep sedimentary and abyssal basins, as well as for deep oceanic trenches. Surface runoff water can pick up soil particles and transport them in overland flow for deposition at a lower land elevation or deliver that sediment to receiving waters. In this case, the sediment is usually deemed to result from erosion. If the initial impact of rain droplets dislodges soil, the phenomenon is called "splash erosion." If the effects are diffuse for a larger area and the velocity of moving runoff is responsible for sediment pickup, the process is called "sheet erosion." If there are massive gouges in the earth from high-velocity flow for uncovered soil, then "gully erosion" may result. When a fluid (such as water) carries particles in suspension, the process by which the particulates settle to the bottom and form a sediment is called settling. The term settling velocity (or fall velocity or terminal velocity (ws)) of a particle of sediment is the rate at which the particle settles in still fluid. It depends on the size, shape, and density of the grains, as well as the viscosity and density of the fluid. where w is the settling velocity; ρ is density (the subscripts p and f indicate particle and fluid respectively); g is the acceleration due to gravity; r is the radius of the particle; and μ is the dynamic viscosity of the fluid. If the flow velocity is greater than the settling velocity, sediment will be transported downstream as suspended load. As there will always be a range of different particle sizes in the flow, some will have sufficiently large diameters that they settle on the riverbed or streambed but still move downstream. This is known as bed load, and the particles are transported via such mechanisms as rolling, sliding, and "saltation" (jumping up into the flow, being transported a short distance, then settling again). Saltation marks are often preserved in solid rocks and can be used to estimate the flow rate of the rivers that originally deposited the sediments. One of the main causes of riverine sediment load siltation stems from "slash and burn" treatment of tropical forests. When the ground surface is stripped of vegetation and seared of all living organisms, the upper soils are vulnerable to both wind and water erosion. In a number of parts of the world, entire sectors of a country have been rendered erosive. For example, on the Madagascar high central plateau, comprising approximately ten percent of that country's land area, virtually the entire landscape is devoid of vegetation, with gully erosive furrows typically in excess of 50 meters deep and one kilometer wide. Shifting cultivation is a farming system that sometimes incorporates the slash and burn method in some areas of the world. The resulting sediment load in rivers is ongoing, with most rivers a dark red brown color. The accumulation of these fine particulates in the water also lead to massive fish kills, as they cover fish eggs along the bottom floor. ↑ “As it reaches the sea: The ending of the journey,” ThinkQuest. Retrieved August 29, 2007. ↑ CyberGeologist: Formation of Point Bars, Schlumberger Limited, 2007. Retrieved August 29, 2007. ↑ Coastal and Marine Geology Info Bank: Point Bars and Cut Banks, United States Geological Survey. Retrieved August 29, 2007. This page was last modified on 27 August 2015, at 14:55.